Stars sparkle like jewels in the night sky over the Oregon desert, the vast southeastern landscape that makes up a quarter of the state. Jewels are evident by day, too, from Hart Mountain's rich wildlife habitat to the Owyhee River's colorful canyons. These special settings, rough on the edges but so rewarding for those who love them, may soon be connected by a trail. And not just any trail. The Oregon Desert Trail will be 750 miles long, a nonmotorized route for hikers, horseback riders and, in part, for cyclists. A mapped trail, with water holes, campsites and waypoints identified, will entice more visitors to learn about, to enjoy and to care for this expansive part of the state. The trail's route has been scouted the past two summers by staff and volunteers from the Bend-based Oregon Natural Desert Association. When the project comes to fruition, perhaps within a year or two, Oregon's desert jewels will be linked by a continuous corridor on public land. An actual trail, like one in a forest, need not be built because the route will link existing tracks with cross-country travel across open terrain. The trail will extend from near Bend to near Idaho, with a southward dip almost to the Nevada border. One of the most ambitious studies of bicycle injuries ever conducted in Canada has reach a conclusion that won’t surprise anyone who rides to work: It is far safer to travel on a physically separated bike lane than on busy city streets. The research, led by Prof. Kay Teschke of the University of British Columbia’s school of population and public health, involved interviewing hundreds of victims of bike accidents in Toronto and Vancouver, and then studying the location where the accident took place. Racklove is a nice place to buy and sell bikes. We're mainly focused in San Francisco, but everyone is free to join. These guidelines are what keeps our community nice. Read through the following page to get a sense of what Racklove is about. If there's anything you'd like to add feel free to contact us by email:rohin@racklove.com or give us a call at (415) 937-RACK. 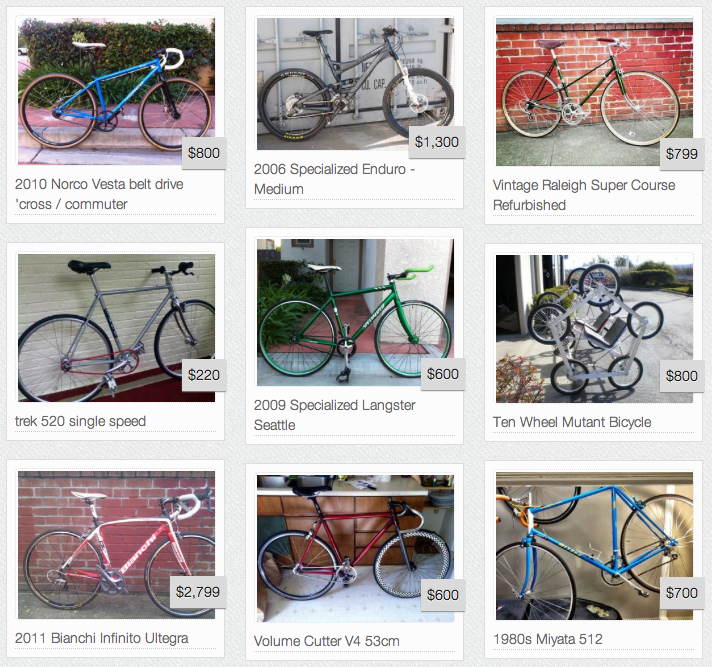 There are already plenty of places on the web to sell your bike if you’re just trying to get rid of it and get some cash. 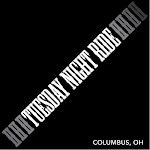 This is a place for people who love bikes to treat each other awesomely. In the description of the bike you are selling, tell us not only about the bike but also about your experience. Every bike has a story. Share yours. If you don't have a description that shows you are the true owner of the bicycle you're selling, this is not the place for you to sell the bike. Bike theft is prevalent only because it's easy to resell stolen bikes online. Join us in ending that. Every year, the U.S. Census Bureau estimates the share of Americans who bike to work. Although the survey only counts people as bike commuters if they ride to work the majority of days (among other restrictions), it's the best way to track the growth of bicycling to work. The League of American Bicyclistscrunched the latest survey data and found that bike commuting rose slightly (though not significantly), from 0.53% in 2010 to 0.56% in 2011. Since 2000, bike commuting grew 47% on average in the U.S. It fared even better in large cities, where it increased 73% on average. If you live in a metropolitan area, you can see how your city stacked up in the chart below or by searching the spreadsheet linked in this blog by the League of American Bicyclists. At PeopleForBikes.org, we're working to help the rest of the country look like Portland in the graph below, where more than 6% of workers typically ride to work. Even more important than the commute to work is the 40% of trips Americans make that are two miles or less—an easy biking distance. You can help us make bicycling for transportation safer and less stressful for Americans by getting involved today! The result is the Coren, a $32,500 fixed-gear ride that the company deems "the world’s most ground-breaking bike.” That’s a bold claim (to go along with a bold price tag), but the bike has certainly succeeded in its main objective: getting people’s attention. It was a standout at the Eurobike convention earlier this year. Zanzotti says he was given "carte blanche" by his client when approaching the project. "From the beginning, it was clear the bicycle had to match the racing history and the spirit of UBC," he told me. "It had to be sportive, and technologically advanced." It also had to be something that only a company like UBC, with years of materials experience, could produce. "The CEO loved the idea of creating a masterpiece that showed the competencies UBC had developed in the last 20 years." In designing the Coren, Zanzotti worked closely with UBC’s engineers, who had a bit of summer downtime between Formula 1 seasons--they "liked the challenge of pushing the material to the limits," he says. After a few months of prototypes, the final design called for a parallelogram-shaped frame built from a type of carbon fiber typically reserved for racecar chassis. Overkill? Perhaps. But the frame does cut a striking figure--and helps the Coren weigh in at a relatively light (though not really crazy light?) 17 pounds. Rather than a conventional chain, the bike employs a carbon-drive belt system, though the company said that single-speed and electric versions are also in the works. Of course, then the Internet came, and as it did Borroughs closed his bike shop in order to focus on a touring-specific online store. First he concentrated on eBay sales, but by the early 2000s he began shifting his focus to his consumer-direct website, TheTouringStore.com. Today Burroughs is one of three full-time employees, and with the exception of one flat year when the stock market tanked, growth has been steady year after year even as the online competition has heated up, and as bike shops nationwide have picked up their collective game in catering to a rising number of urban and utility cyclists—and by proxy, to true bicycle tourists. While it’s hard to parse touring bike and accessory sales from available numbers, let alone separate commuters from actual bicycle tourists, anecdotal evidence and reports from manufacturers all suggest a definite swell in the touring market over the past several seasons. “Bike touring used to be a niche activity, but now it’s branched into several areas,” said Michael Deme, publications director for the Adventure Cycling Association in Missoula, Montana. The ACA has experienced back-to-back banner years, noted Deme. “We’ve gone from being $30,000 in the red five years ago to netting positive numbers that keep going up,” he said. In the past decade ACA membership has gone up 19 percent, its map sales are up 48 percent, and donations have tripled. The nonprofit now operates with a $4.1 million budget, and its network of mapped bike routes has grown to 42,000. Three of those routes go through Missoula, and more than 1,000 bike tourists stop into ACA headquarters every year. Aside from ACA’s success, the most telling barometer of the health of bicycle touring is actual bike and accessory sales. “I can’t help but think it is growing,” said Salsa brand manager Jason Boucher, who is quick to add that although Salsa’s sales in the category are strong, the brand has only been at it since 2009, when it introduced its Vaya touring bike. Since then the Vaya has grown from one to three models, and for 2013 the top-level titanium model is being replaced by a stainless steel version with S&S couplers called the Vaya Travel. Up until last year, Adam Vollmer had been making a pretty good run of things as a mechanical engineer at Ideo. He was responsible for developing groundbreaking new instruments for spinal surgeries and had worked on solutions for improving access to drinking water in developing countries. Today, he’s the founder and CEO of a company that makes bicycles. Just one bicycle, actually--the Faraday Porteur, a handsome $3,800 ride with bamboo fenders, pistachio accents, and a cleverly hidden on-board lithium ion battery and front wheel motor. Yep, it’s an e-bike, a designation that’s at the heart of the challenge Vollmer’s facing with his new venture: how to build an electric bike for a country that just doesn’t really like the things all that much. Coast Protocol Episode 2: Gaining Momentum in Vancouver from America ByCycle on Vimeo. Vancouver, Canada! Finally the adventures begin as the tire meets the road in the streets of British Columbia. Accompanied by Tania Lo, Co-Publisher of Momentum Mag, we take a closer look at the downtown's bicycle-friendly infrastructure. After speaking with Tania we also learned about her inspiring involvement with the documentary Long Road North, which encapsulates a bicycle tour from the tip of South America to the Canadian Arctic. With much time to spare, we explore the city with the lovely ladies from Birds on Bikes and ride into the sunset. Coast Protocol Episode 1: Goats, Boats, and Spinning Spokes from America ByCycle on Vimeo. Nearly a year after returning from their last trip, the America ByCycle team gets ready to hit the road once again. Now accompanied with their new member, Alex R. Favacho, they head north to Vancouver where this west coast adventure begins. This video will be one of many which aims to highlight, interview, and get to know the people and places they meet along the way. With much gratitude and appreciation, they give their thanks to all who have helped them. There are a bevy of benefits to bike-friendly communities including improved health and reduced pollution, but two new studies reveal a rather unexpected benefit, an increase in consumer spending. In his article How Bicycling Creates Economic Impact: A Tale of Two Cities, Leon Kaye with Triple Pundit discussed the results from two different surveys, one covering biking and spending trends in Portland, Ore., and the other in New York City. The City of Toronto is finally getting a separated bike lane. It's on Sherbourne Street, a block east of the soon to be painted out Jarvis Street bike lanes that keep city councillors from getting home in time for dinner. The separation is a rounded bump that is too big for a cyclist to cross easily and safely, but not too big for a UPS truck. So now, when they park in the Fedex Lane (as I call our bike lanes), cyclists will have to dismount and go around them. According to Jack Lakey in the Star, they didn't have any choice. 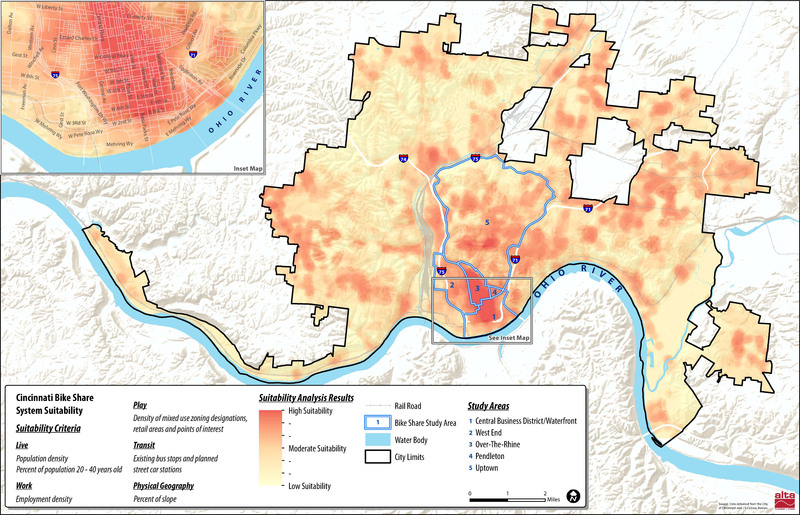 A new study, prepared by Alta Planning + Design, has determined how and where a bicycle sharing system could be implemented in Cincinnati in a way that will compliment its expanding Bicycle Transportation Program. The recently released report was called for by city leaders in May 2012, and identifies a 35-station, 350-bike system that would be built over two phases in Downtown, Over-the-Rhine, Pendleton, Clifton Heights, Corryville, Clifton, Avondale and the West End. Several neighborhoods throughout the city were determined as potential areas to be included in a future Cincinnati bike share system. Map provided by Alta Planning + Design. Columbus could be the latest major U.S. city to get a bike-share program. The city’s Recreation and Parks Commission on Oct. 10 recommended approval of a five-year, $2.2 million contract with ALTA Bicycle Share, based in Portland, Ore. The money will go toward setting up the 30 bike stations, card-swipe systems, purchase of bicycles and other startup costs, said Terri Leist, planning administrator with recreation and parks. The plan, which could go into effect as early as May, would put 300 bicycles on the streets of downtown and surrounding neighborhoods, including the Short North, German Village and the Brewery District. ALTA would be responsible for maintaining the program after the first year. After that, any revenues that exceed the annual operating expenses would be split 50-50 between the city and ALTA, Leist said. Columbus City Council must approve the contract. Short-Term Recommendations: Adopt a clear and strong set of rules of the road for all modes of transportation to raise awareness and reduce accidents on campus. Actions to achieve this recommendation will include a comprehensive, layered, educational campaign for all modes of transportation aimed at establishing expectations for pedestrian, cyclist and motorist behavior. This will be coupled with a layered enforcement strategy consisting of information sharing followed by a warning campaign and enforcement efforts. Enhanced signage will also play a role in bringing attention and providing clear direction to the actions required at crosswalks. The Oval will be established as a dismount zone for cyclists to begin a cultural shift on campus regarding which modes of transportation are safe and suitable for specific areas. The university will also look at new ways to reduce traffic congestion on campus by evaluating delivery, maintenance and construction traffic with the goal of reducing overall traffic and eliminating unnecessary deliveries, particularly in the campus core. Long-Term Recommendations: Create a campus culture that is accommodating and respectful of all modes of transportation. The university will conduct a comprehensive study of the campus' multimodal circulation patterns and behaviors. From this analysis a strategy for design, regulation and enforcement will be crafted. Increasing traffic safety on campus will require the work and partnership of faculty, staff and students, so the university will empower campus groups such as Council On the Physical Environment, the Department of Public Safety, and student governments to lead efforts across campus in implementing the goals of the Traffic Safety Task Force. Education and enforcement must be sustained and become a part of the campus culture. The Traffic Safety Task Force recommendations are intended to be realistic, sustainable and impactful. The short-term action items will generally be planned and implemented over the next four to six months, although implementation of some items could begin in the next two months. The results of the short-term actions will help identify and inform the steps needed to achieve the long-term cultural change in traffic safety behaviors on campus. The university will also engage the City of Columbus to review and make improvements on High Street and other heavily traveled city streets near campus. President Gee accepted these recommendations and implementation will begin immediately. As President Gee said, there is no greater priority than the safety and well-being of our students and campus community. Many of these strategies will require engagement from students, faculty and staff and a commitment from the entire campus community to create a culture of safety – whether we are walking, biking or driving. We appreciate your continued support and diligent attention to this important campus effort as we make progress. A bicyclist is hospitalized after being hit by a car near the Ohio State University campus. The crash occurred in the 1800 block of North High Street near 16th Avenue at about 4:45 p.m. The bicyclist was struck by a car and transported to Riverside Methodist Hospital in stable condition. The driver of the vehicle and a witness told police that the bicyclist was riding on a sidewalk when he hopped off and tried to rid through the crosswalk. Officers said that riding a bicycle through a crosswalk is a violation, and the cyclist could be cited. One northbound lane of North High Street is closed during the cleanup and investigation. Columbus police is investigating the crash. 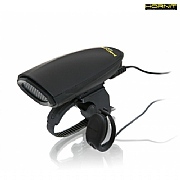 Hornit Db140 Horn - The world's loudest cycle horn. The world's loudest cycle horn. At 140db it's equivalent to a jet engine and 4x louder than the competition. Now cyclists can actively alert lorries, buses, cars and pedestrians to their presence (rather than hoping than to be seen) which makes cycling safer.